View More In Comfort Bikes. 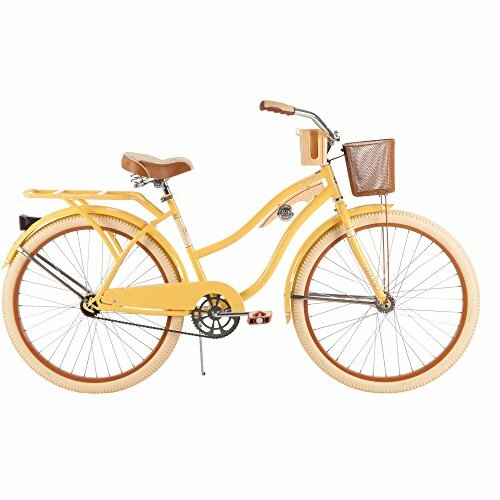 Picture yourself with a scarf tied in your hair, wearing oversized sunglasses and pedal pushers while cruising down the boardwalk on the banana-yellow Huffy Nel Lusso. Even if you don't live close to the beach, you'll feel like a million bucks moseying down the street on this stunning 26-inch cruiser bike, which features a front basket with room for your sweater and phone, or maybe even a small canine friend. When you need to carry a bit more (pizza anyone? ), the rear rack is at your disposal. The handlebars even have a beverage holder, a great spot for a slushy fruity drink. The Huffy Nel Lusso has classic fenders to keep you dry, plus comfortable features that you'll love, like the padded spring saddle and dual-density grips and pedals. This adorable single-speed bike has an easy-to-use coaster brake.